Toronto and Region Conservation Authority (TRCA) is working with our partners to develop an 1,100 kilometre network of regional trails that will create opportunities for people throughout the Greater Toronto region to explore and enjoy natural green space. TRCA’s new Trail Strategy will guide our efforts to complete the work and sustain this trail network for generations to come. Our public commenting period concluded on January 18, 2019. The Draft Trail Strategy and Workbook documents can be accessed by clicking the link below. Over the past 60 years, TRCA has worked with partners to give the public responsible access to nature through scenic recreational trails and greenways. In 1989, we proposed the concept of a Greater Toronto Region trail network, connecting neighbourhoods from the Oak Ridges Moraine and the Niagara Escarpment all the way to the shoreline of Lake Ontario. Since then, working in partnership with community groups and all levels of government, TRCA has developed this network. Today, within our jurisdiction, there are more than 500 kilometres of regional trails. In addition, we have planned and implemented local and neighbourhood trail connections to give residents access to conservation lands and local trail systems. 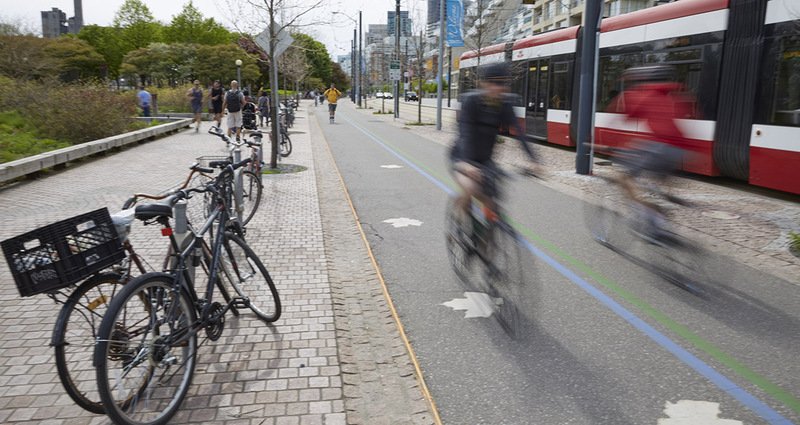 This comprehensive network plays many important roles: securing greenspace, mitigating climate change, improving residents’ health and well-being, promoting responsible public access and inspiring environmental stewardship. The Greater Toronto region is experiencing unprecedented urban growth. By 2041, our population is projected to increase 40 percent, reaching close to 10 million residents. As we continue to expand our trail infrastructure, we need to support these new and growing communities while mitigating the environmental impact associated with intensification. Expanding greenspace and providing trails more equitably across TRCA’s jurisdiction will provide under-served communities with nature-based amenities, recreation opportunities and active transportation, while helping to improve the collective health and well-being of residents across the region. To realize these possibilities, TRCA needs to target its efforts and capitalize on development opportunities in accordance with its own environmental planning policies and objectives. To this end, TRCA has prepared its draft Trail Strategy — a document providing a strategic vision for this next generation of trails. The vision for the Greater Toronto Region Trail network sees a complete regional trail system in greenspace that connects our growing communities to nature and to each other, supporting active living and enhancing our conservation legacy. 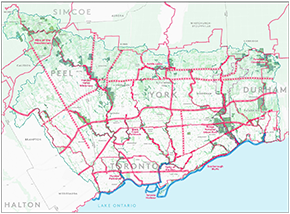 The concept for the Greater Toronto Region trail network sees the development of more than 570 kilometres of proposed trails through the Oak Ridges Moraine, the valleys of the Etobicoke, Mimico, Highland, Petticoat and Duffins Creeks, the major valleys of the Don, Humber and Rouge Rivers, and the Lake Ontario Waterfront, as well as regional infrastructure corridors (including transit, utility and electric power facility corridors). It also envisions the introduction of blue trails, which are paddling routes on our navigable waterways. And it proposes investment in 10 conservation destination areas to enhance the trail network and provide amenities. Combined with the 530 kilometers of existing trails in our greenspace system, the final result would be a network of more than 1,100 km of regional trails for the Greater Toronto Region. 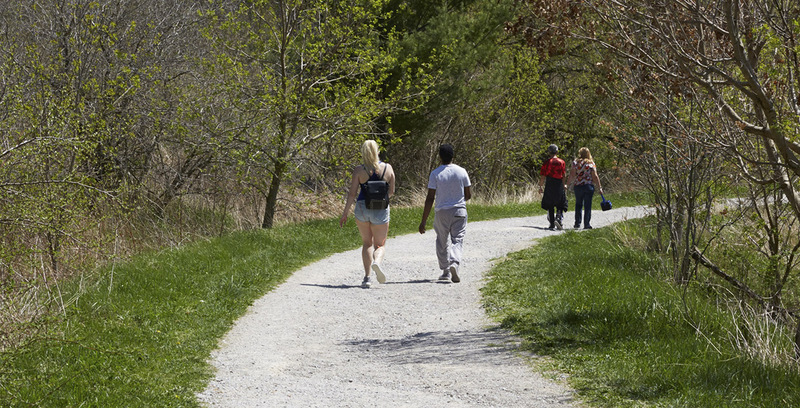 We welcome public feedback on the TRCA Trail Strategy.